You’ve picked the perfect cottage for your Norfolk holiday with Barefoot Retreats , the bags are packed and the buckets and spaces are ready for your beach adventures. Why not capture the happy memories of family holidays with a photoshoot while you are staying here in Norfolk. 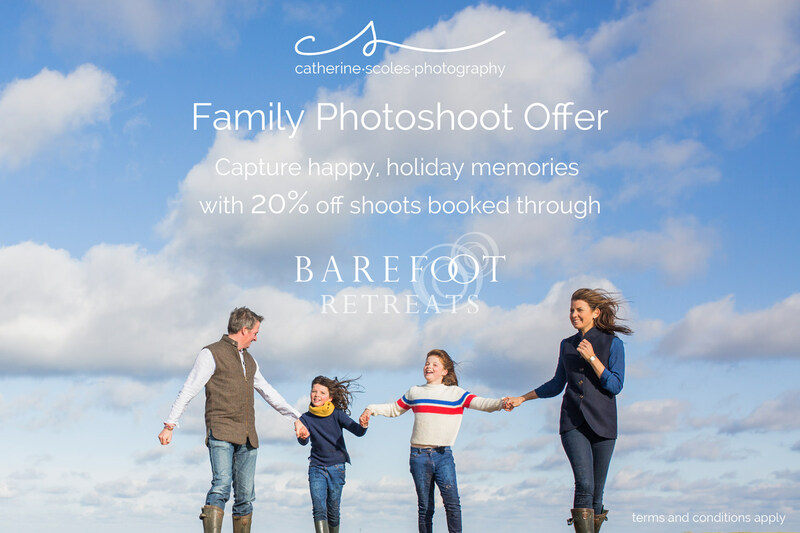 Catherine Scoles Photography is currently offering 20% off family photoshoots booked for while you are staying at a Barefoot Retreat. The photoshoots are fun and relaxed getting the best out of you and your family. The photoshoot last around an hour at a location of your choice within the North Norfolk area. You will receive all the edited digital images (around 50) via a password protected downloadable gallery (with permission to print and share) and Cat will also be on hand after the shoot to help you print, frame or make beautiful photobooks. For more information visit Cat’s family photography page or get in touch using the form below. Date of your stay with Barefoot Retreats? Which Barefoot Retreat are you staying in? Number of Adults and Children for the shoot? Are you celebrating anything special? Birthdays, Anniversaries or Engagements? Of course there are a few terms and conditions…. Photoshoots must be booked and a non refundable deposit of £75 paid by 30th April 2018. Property name and dates of your stay must be confirmed upon booking. The shoot will take place within the North Norfolk area while you are staying with Barefoot Retreats, Monday – Friday until 30th November 2018. Normal price of £295. Offer price £236. The Final payment of £161 will be payable on or before the day of your shoot. You will receive the digital files via a password protected downloadable gallery (with permission to print and share) within 1 month of your shoot. Please quote SCOLES&BF20 when booking.